Welcome to Today@WKU, the daily newsletter from WKU Public Affairs, for October 25, 2018. Student chapter of American Institute of Floral Designers formed at WKU: WKU has established a campus chapter of a national organization that will help horticulture and floral design students while honoring a retired faculty member. The James M. Martin Western Kentucky University Student Chapter of the American Institute of Floral Designers will expand opportunities for students to gain experience in the art of floral design, said Roger Dennis, clinical assistant professor of agriculture and chapter advisor. Follow WKU News: Subscribe to our daily email newsletter; follow WKU News on Twitter @wkunews or on Facebook at http://www.facebook.com/WKUNews. Football: Practice Report: WKU Football finished practice Wednesday evening as the Hilltoppers prepare for their Homecoming game on Saturday against Conference USA opponent FIU. Kickoff at Houchens-Smith Stadium is set for 6:30 p.m. CT with broadcast on beIN Sports. In last season's matchup against FIU, the Hilltoppers were not able to sack the quarterback in a 41-17 loss in Miami. The defensive line putting pressure on the quarterback is going to play a pivotal role in this upcoming matchup. Baseball: Hilltoppers Release Full 2019 Schedule: For the 100th season of WKU Baseball, head coach John Pawlowski and the Hilltoppers have announced the 2019 schedule. "We are all proud and honored to part of the 100th season of WKU Baseball," Pawlowski said. "The 2019 Hilltoppers look forward to a challenging and exciting season ahead of us. We hope to see everyone at 'The Nick' to help us make this a special 100th season." Men’s golf: Sargent Named C-USA Co-Golfer of the Week After Playoff Win: On the heels of winning his fourth career title in a playoff, WKU Hilltopper Golf's Billy Tom Sargent has been named Conference USA Men's Co-Golfer of the Week, the league announced Wednesday. This is the fourth career weekly award and the first of the season for Sargent. More: For updates on WKU Athletics, follow @WKUSports on Twitter or WKU Athletics on Facebook. WKU Food Pantry helps students, faculty in need: As you drive or walk down Regents Avenue on the campus of WKU, you'll pass by several houses on either side of the street that look nothing more than just that - houses. A few do have signs out front, though, signifying that they're WKU buildings, including the Office of Sustainability, located on 503 Regents Ave. But if you take a step inside that particular house, you'll find there's more than meets the eye, and that includes a resource that's being used to help out students and faculty members in need. Bikes for new program demonstrated at WKU: WKU students had the opportunity Wednesday to take a look at a new bike sharing program coming to campus. Parking and Transportation Services staff promoted the new VeoRide bike share program. WKU leaning on freshmen Samuel, Appleberry out of the backfield: A key component to the youth movement for WKU’s offense has been the play of a pair of running backs improving each week during their respective rookie seasons. Josh Samuel and Gino Appleberry are now the top two rushers for WKU heading into Saturday’s game against Florida International (5-2, 3-0 Conference USA) at 6:30 p.m. at Houchens-Smith Stadium. And both are freshmen. Anderson ready for season with new position, improved shot: Josh Anderson showed in spurts as a freshman why he was a top-60 national recruit in the Class of 2017. Now a sophomore, the WKU guard had all offseason with the program to train, learn a new position and improve his game. Coach Rick Stansbury thinks Anderson is ready to unleash his potential. More: Check out WKU in the News page. More: Visit the WKU Alumni website. Exhibits at Kentucky Museum: A Culture Carried: Bosnians in Bowling Green (through May 11, 2019); Kaleidoscope: Kentucky Museum Quilts (through Dec. 15); The Essential Tree (through Dec. 15); Process Oriented Works (through Dec. 14); Salient Features: Trees of Old Forests and Woodland Pastures (through Dec. 1); plus other gallery and on-campus exhibits. (Museum hours/visitor information) Contact Kentucky Museum, (270) 745-2592. Exhibits at Downing Museum: The Story of Joe Downing: Select Works From the Collection. Downing Museum, 4801 Morgantown Road. Contact Jack LeSieur, (270) 842-7415. Photo Exhibits: WKU Project 68. Through Nov. 27. Jody Richards Hall Atrium. The Women Photojournalists of Washington, D.C. Through Nov. 27. Jody Richards Hall Gallery. Contact School of Journalism & Broadcasting, (270) 745-4144.
International Year of Cuba: Various events during the 2018-19 academic year. Contact International Programs, (270) 745-5334. ISEC Exhibit: Faces of Domestic Violence. Oct. 1-31. Cynthia and George Nichols III Intercultural Student Engagement Center, Downing Student Union. Part of Domestic Violence Awareness Month. Contact Elizabeth Madariaga, (270) 745-3159. 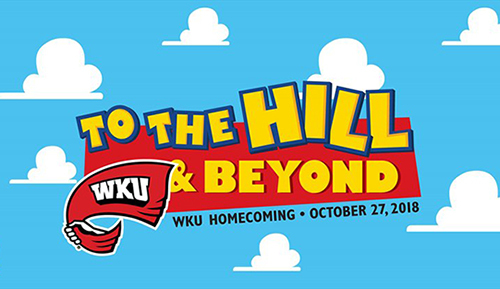 Homecoming 2018: To the Hill and Beyond. Oct. 25-28. Various events and locations. Contact Alumni, (270) 745-2586.
International Education Week. Nov. 5-9. Various events and locations. Contact International Programs, (270) 745-5334. 11 a.m.: Homecoming Chili and Cheese Luncheon and Pep Rally. 6.4.3 Sports Bar, 360 E. Eighth Ave. Part of Homecoming 2018. Contact Alumni, (270) 745-2586. 3:45 p.m.: University Senate Meeting. Faculty House. Contact Academic Affairs, (270) 745-2296. 6 p.m.: Summit Awards Dinner. Augenstein Alumni Center. Part of Homecoming 2018. Contact Alumni, (270) 745-2586. 7 p.m.: Hardin Planetarium Show: Lives of the Stars. Hardin Planetarium. Contact Planetarium, (270) 745-4044. 8 a.m.: Board of Regents Committee Meetings. Martin Regents Room, Jody Richards Hall. Contact Bob Skipper, (270) 745-4295. 11 a.m.: Hall of Distinguished Alumni Luncheon and Induction Ceremony. Inductees are Becky Ann Gelke Baker, Nettie Bayless Courts Depp and Dr. Richard C. Rink. Sloan Convention Center. Part of Homecoming 2018. Contact Alumni, (270) 745-2586. 3:30 p.m.: Hilltopper Hall Ribbon Cutting. Hilltopper Hall. Contact Housing, (270) 745-4359. 5 p.m.: Homecoming Parade. WKU campus to Circus Square Park, downtown Bowling Green. Part of Homecoming 2018. Contact Alumni, (270) 745-2586. 5:30 p.m.: Homecoming Concert in the Park, featuring Jordan English. Circus Square Park, downtown Bowling Green. Part of Homecoming 2018. Contact Alumni, (270) 745-2586. 6 p.m.: WKU Soccer vs. Marshall. WKU Soccer Field. Contact Athletic Communications, (270) 745-4298. 6:30 p.m.: WKU Forensics Showcase. Faculty House. Contact Ganer Newman, (270) 745-6340. 6:30 p.m.: Big Red’s Roar. Circus Square Park, downtown Bowling Green. Part of Homecoming 2018. Contact Alumni, (270) 745-2586. 7:30 p.m.: Performance: Fourth Annual Halloween Concert by the Symphony at WKU. Van Meter Hall. Tickets are $12; $6 for students. Contact Music, (270) 745-3751. Homecoming Day. Various events and locations. Part of Homecoming 2018. Contact Alumni, (270) 745-2586. 8 a.m.: Football Tailgating Areas Open. Various locations. 2018 tailgating map. Contact Campus and Community Events, (270) 745-2497. 9:30 a.m.: Fall Super Saturdays. Various campus locations. Continues Saturdays through Nov. 10. Contact Gifted Studies, (270) 745-6323. 10 a.m.: Alumni W-Club Athletic Hall of Fame Induction Ceremony and Brunch. Inductees are Crystal Kelly, Matt Wilhite and Rick Yeloushan. Part of Homecoming 2018. Contact Paul Just, (270) 792-4247. Noon: WKU Softball Alumni Game. WKU Softball Field. Contact Athletic Communications, (270) 745-4298. 2 p.m.: WKU Alumni Tailgate & Celebrate. WKU South Lawn. Contact Alumni, (270) 745-2586. 5 p.m.: Pre-College Strings Halloween Recital. Ivan Wilson Fine Arts Center Recital Hall. Contact Music, (270) 745-3751. 6:30 p.m.: WKU Football vs. FIU. Houchens Industries-L.T. Smith Stadium. Homecoming Queen will be crowned at halftime. Contact Athletic Communications, (270) 745-4298. 8 p.m.: NPHC Step Show. Van Meter Hall. Contact Randall Bogard, (270) 745-5809. 2 p.m.: Mary Ellen & Jim Wayne Miller Celebration of Writing. Kentucky Museum. Part of Homecoming 2018. Contact English Department, (270) 745-3043. 2 p.m.: Hardin Planetarium Show: Lives of the Stars. Hardin Planetarium. Contact Planetarium, (270) 745-4044. Caring for others is deep rooted for WKU senior, Haley Wheeler. She recently made a generous donation of handmade activity mats for therapeutic use at local Bowling Green nursing homes through WKU’s Center for Applied Science in Health and Aging (CASHA). On Saturday (April 27) from 10 a.m. to 5 p.m. at the SKy Science Festival in Circus Square Park, WKU’s Hardin Planetarium offers an opportunity for attendees to build and launch rockets.